Please join us this Sunday, April 27th from 3:00 p.m. to 6:00 p.m. for a showing of Anzula Yarns. They are bringing completed samples of their patterns as well as their yarn. You will be able to purchase their yarns on Sunday. Join us for refreshments and the opportunity to view these wonderful yarns. If you are not familiar with this yarn, check out Ravelry.com and see many projects using this yarn! Picture here is Marilyn passing out candy to the children on Halloween. 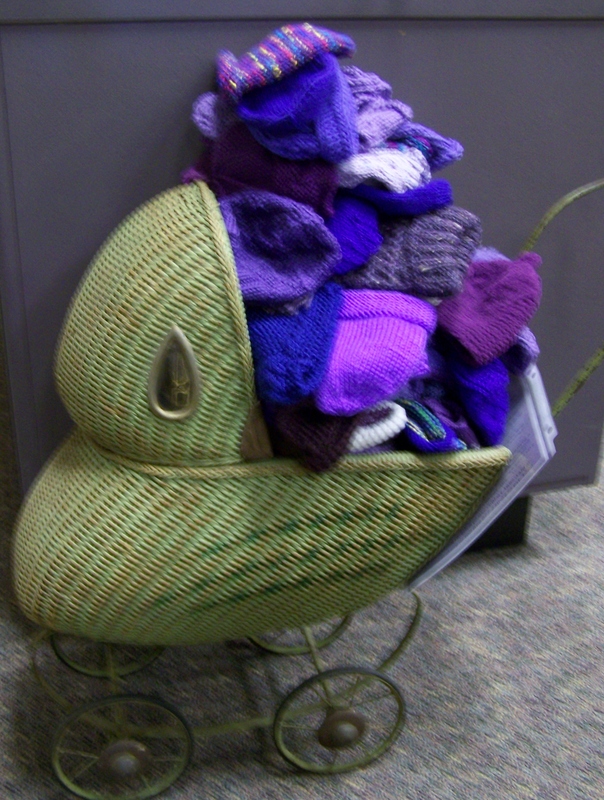 As you can see from this 2012 photo, we filled my mother’s seventy year old doll buggy with little purple baby hats for Click for Babies. Once again, we have pulled this buggy out of storage and have a great start on providing as many hats this year as we did last year. As you may know, this organization educates new parents of the dangers of shaking a newborn during those difficult crying stages that many babies experience. Our crochet/knitted hats are very much a part of this organization’s presentation. Remember hats need to be at least 50% purple and newborn size. Help us once again to fill this buggy with hats for Click for Babies. Don’t forget to join us for our weekly Social knitting/crocheting time. I have been asked for the recipe for the Gingerbread Boys cookies that were served at Yarns Christmas in July party. One batch makes approximately 55 medium sized cookies. Whisk together flour, soda, salt, cinnamon, ginger and cloves and set aside. In mixer, cream butter and sugar. Add egg and molasses and beat until smooth. Add flour mixture; do not over mix. Separate dough into 2 balls and flatten into disks. Wrap each tightly in plastic wrap and refrigerate 1 hour. Remember when we all made the Mystery Socks? 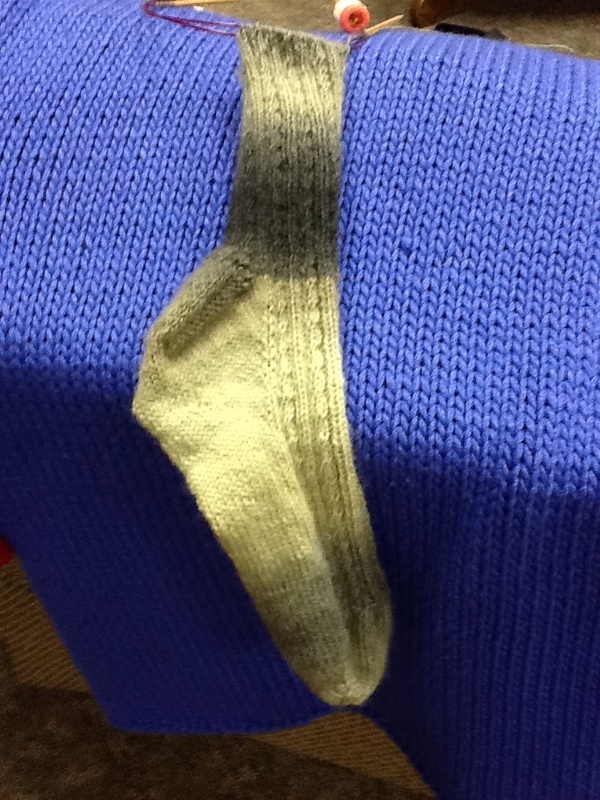 Well, here are some examples of the socks now that the Great Mystery has been solved! 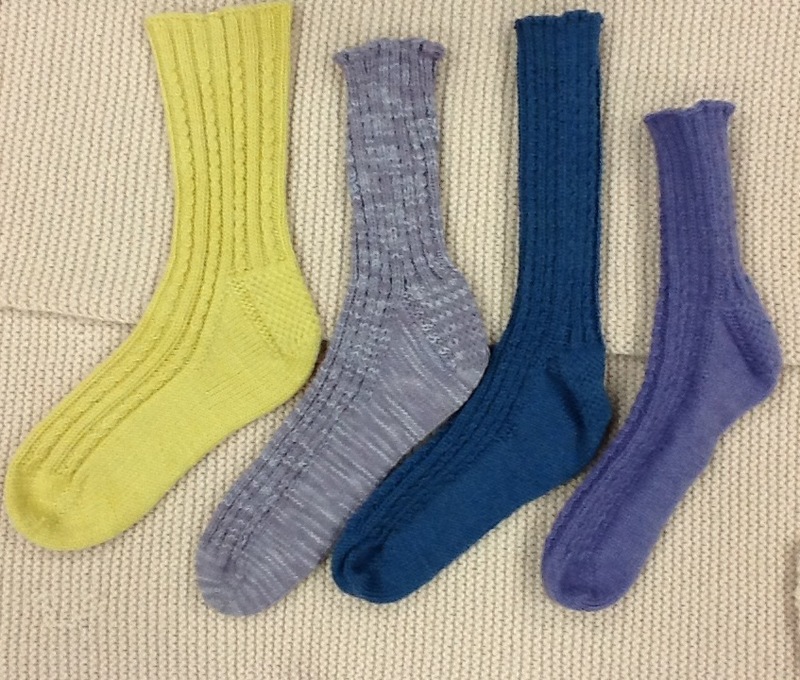 Interested in making socks? 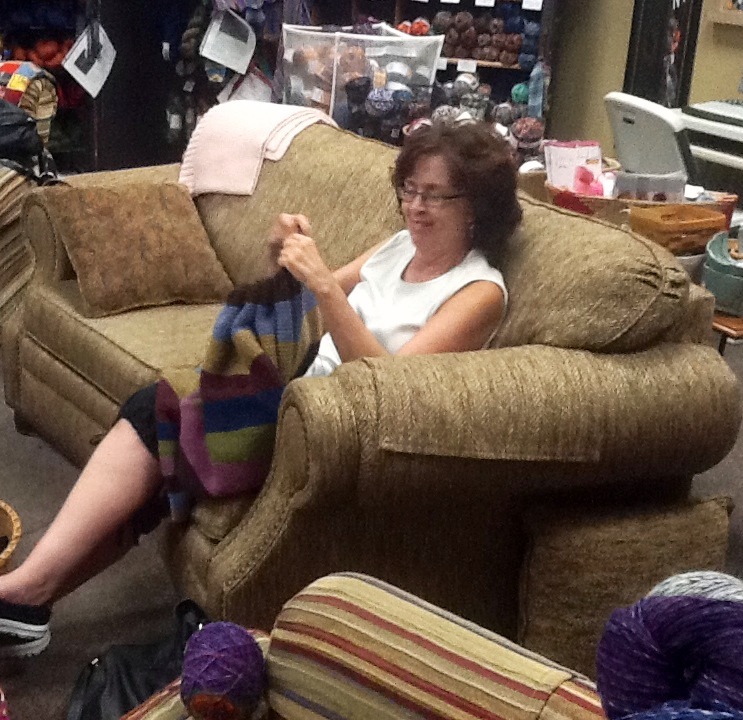 Each second Thursday of the month from 5:30-7:00 p.m., Connie Jo leads the Sock Club. Sometimes there is a discussion about a different new pattern or technique, and sometimes it is a “let’s just get together and knit socks” night. Join us if you can! The most important “event” each week at Yarns Sold and Told is our Social Knitting/Crocheting times. Each Tuesday afternoon and Wednesday afternoon and early evening, we just enjoy sharing our love of yarn and our friendships created at Yarns Sold and Told. Everyone is always welcome whether you are new at knitting or crocheting or have been crazy about yarn for years. Stop by and join us! So, what is more fun than a yarn shop? Well, it would have to be lots of yarn shops! Mark your calendar for the Central Kansas Yarn Hop Thursday, October 17 through Sunday, October 20 and join us for a fun filled weekend.